Also known as lightening bugs, fireflies , are actually beetles belonging to the Lampyridae family of insects. There are over two thousand species, about one hundred fifty of which live in North America. Fireflies occur in the temperate and tropic areas of all continents except Antarctica and can be found in wet areas such as marshes and wet woodlands that are essential for larval development. Although they were once very abundant in many areas their numbers have declined probably due to habit loss, pesticide use, and light pollution. Adult fireflies have soft brown, black or charcoal bodies .75-1 inch long and leathery wings. Their small head has two large compound eyes and is protected by a plate like structure, the pronotum, that may be tinted with pink, red, yellow or salmon. The last segment of their abdomen has special cells that combine oxygen with luciferin to produce green, yellow or red light with almost no heat. Fireflies use their bioluminescence to attract mates and each species has its own unique pattern of flashes that vary in number and duration. Males signal first and females signal a response. The females of one species mimic the flashes of another species in order to attract a male that she then devours. 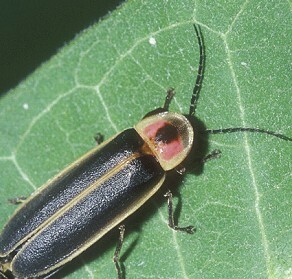 Bioluminscence may also be a protective device warning predators that the firefly has a very bad taste. The firefly larvae are brown to black but some are brightened by a noticeable pattern with white, pink yellow, and/or red. They have three pairs of legs and an armor- like covering, and range in size from less than ½ inch to a little over an inch. The head end is tapered while the posterior end glows, giving the larvae the common name glowworm. The name glowworm, however, is also applied to several other bioluminescent insects. Fireflies like all beetles go through complete metamorphosis with four stages: egg, larvae, pupa, and adult. Larvae over winter in the soil where they pupate and then emerge as adults in the spring. After mating, females usually lay about 100 spherical eggs that may glow on the soil in moist places near ponds and streams, or in leaf litter. Larvae emerge in three to four weeks and feed at night until winter when they burrow into the soil. There are many variations of the life cycle depending on species but most species fit this general pattern. Although fireflies are best known for their bioluminescence, they are also beneficial insects. The larvae feed on slugs, snails, worms, and insect larvae. After capturing their prey the larvae inject them with a chemical that paralyzes them and liquefies the body contents. Little is known about the diet of adults but scientists think that some adults feed on pollen and nectar while some feed on other fireflies, as mentioned above. Some species have no mouth parts and do not feed at all. In order to attract and maintain fireflies in the garden the needs of both adults and larvae should be met. Females seek moist places to lay eggs so if you lack a water feature make sure that plenty of leaf litter is available. The leaf litter attracts the slugs, snails, worms, and insect larvae that make up the diet of the firefly larva diet. Adults probably need flowers for nectar and pollen so a large variety of plants will meet their needs. In addition the adults need cover and like tall grass, low growing plants, and shrubs. A few like trees. Dimming outdoor lights aids in mating as bright lights interfere with males and females recognizing each other’s flash signals. Finally, avoid pesticides as much as possible.